Something is going on in my mind. For the past three mornings I’ve woken up at 4 am, unable to go back to sleep and with one thing on my mind. It isn’t a thing that directly impacted me, it won’t alter the day-to-day realities of the rest of my life, and yet I feel the need to purge myself of my thoughts and feelings. This thing isn’t mine, I can’t claim ownership of it, as it really happened to someone else—to several someone else’s, actually—and yet I’m in a community of people who are feeling the sting. On February 8, 2016 Deputy Derek Geer, with the Mesa County Sheriff’s Office, responded to a call. The suspect that he contacted was a 17-year old boy. There was an altercation. Deputy Geer attempted to use his taser to subdue the suspect. That 17-year old proceeded to fire a gun—several times—leaving Deputy Geer mortally wounded. 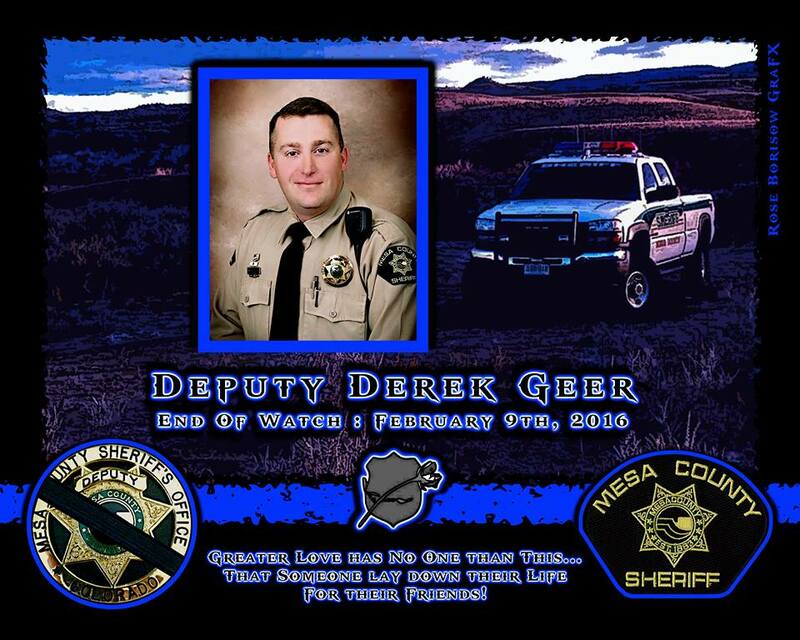 For residents in Mesa County the shooting of Deputy Geer has been a shocking blow. Although our community has grown significantly, a large number of residents have been here since it was a small town, and Grand Junction has managed to maintain its small town personality, despite its growth. Our town is a true “six-degrees” type of community: everybody is connected to someone else in town by no less than six steps—more often only 2-3. While we realize that we aren’t immune from the crimes and tragedies that happen in larger cities, we haven’t experienced many of them yet. The last deputy of the Mesa County Sheriff’s Office to be killed in the line of duty was in 1906. Our Police Department has only suffered from one active duty loss when, in 2004, a K9 officer, Gero, was shot and killed. Because of our size, our history, and the close ties in our community, it was devastating to find that our law enforcement personnel—valued members of our community—aren’t as safe as we imagined them to be. And, because our citizens are so closely linked together, even those who didn’t personally know Deputy Geer or his family knew someone who did know them. We knew his friends, his coworkers, and those of his wife and children. We saw how it hurt those who were directly impacted. We knew details about how his family was notified, who was with them at any given time and who was preparing them dinner that night. We saw the local law enforcement at the hospital, and later at the mortuary, standing sentry (which they may not realize that we saw, and appreciated, but lacked the words to pass on). And, we waited until the final announcement had been made, that Deputy Derek Geer had committed his final selfless act—the donation of his organs—on February 10. On Monday, our community—and others from across the U.S.—showed up in force to bid our final respects to Derek Geer. The support was so great that several remote locations were used and the services streamed to those sites. Even with the staggering number of people watching the services, the streets of our town were crowded along the processional route with those paying their respects. It was truly awe-inspiring that our community came together once again, like the small town we still identify as, to say good-bye to one of our own. And, while I know that the loss to Kate Geer and her children is far greater than what we experienced, I am still saddened for my community in what we lost along with Derek Geer. We lost a little more of our innocence and our sense of safety. But, we also proved how strong we are and how our neighbors will pull together to support each other in the darkest of days. For that—the overwhelming sense of living a community that will stand up together to say, “you are not alone”—I am grateful.